From goodreads: Can you ever really outrun your past? A Life More Complete is a beautiful love story, one that captivated me from the start. I think what I love about this book is that it’s different and that’s all I ever want is a story to be unique. Not only is the story written well but the characters have their quirks and complexities which takes the reader on an emotional rollercoaster. Anyone who knows my taste in books knows that this is exactly my kind of story! Krissy is strong, fierce but she’s fighting her own demons and frankly, she knows a thing or two on how to self-sabotage a good thing. Not only is she a workaholic but she gives herself emotionally to her clients which leaves her for little of anything else. The predicament she finds herself in with regards to Ben and Tyler is heartbreaking and yet incredibly relatable. Enter: Ben Torres. Ladies, be prepared to swoon and swoon hard! He gets Krissy like no one else does and he has the patience of a saint when it comes to her. To me, he was perfection but I felt I got very little time to know him. I wanted more of Ben but the little time I had with him, I knew he was “the one”. He had to be!!! He’s everything Krissy needed and more. Let’s put Ben Torres off to the side for a moment so I can focus on Tyler. Tyler is another love interest of Krissy’s and I wouldn’t say there’s a love triangle but there is one of sorts. I don’t want to give anything away but I’m Team Ben all the way! Sometimes I felt that Krissy was going through the motions and hiding in the shell of a person that continually wanted to play it safe. But safe doesn’t always mean better, sometimes we recycle old patterns and behaviors because it’s what we know. And Krissy learned a thing or two from her mother and her mother made me cringe! A Life More Complete will make your emotions swing like a frantic pendulum but the ride is so worth it. This is a story about choices we make and learning to live with the consequences of our actions and ultimately we cannot change our past, just our present. This is that story. Natasha is a Book Junkie is the one who mentioned I would love A Life More Complete and she wasn’t kidding! A beautiful debut novel indeed and I look forward to more books by Nikki Young in the future! Nikki Young was born and raised in the suburbs of Chicago where she still currently lives with her husband and two boys. She is a third grade teacher and spends her days forcing her love of reading and writing onto a group of poor unsuspecting eight year olds. 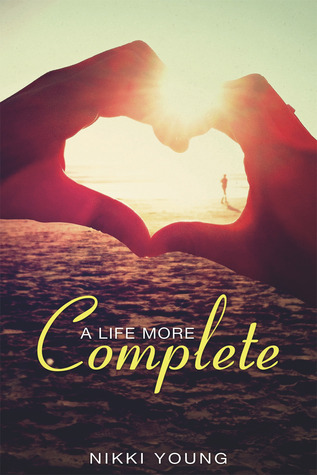 Want to win a SIGNED PAPERBACK or one of two ebook copies of A Life More Complete? Click on the image below! Good luck! Thank you and thank you so much for stopping by! !